Information on the chemical make-up of aramid fibers can be found here and some of the different lower cost alternatives brands with specifications of filament aramids can be found here. Aramid yarns producers, like DuPont™, extrude aramid in the multi-filament form and also produce it in a bail form similar to cotton. These are not typically the forms of aramid that are required for the common industries it is used in. Yarn spinners, converters and thread manufacturers use these forms to wind, twist, coat, weave and construct yarns, fabrics and threads so aramids are able to be processed in the manufacturing industries they are typically seen in. 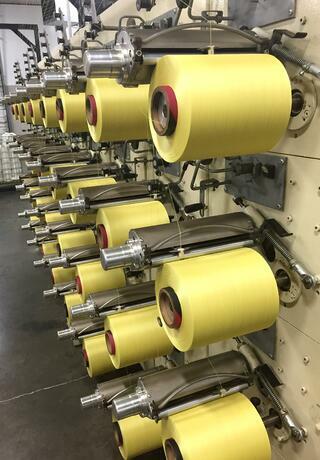 Below is a picture of Kevlar® in a bonded twisted multi-filament sewing thread form used to sew high temperature escape belts. 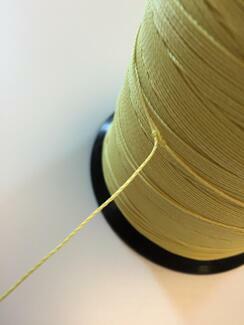 Do you need help determining the best Aramid to use in your process?